Zhu Xi, rite Zhū Xī, vel Chu Hsi (朱熹, Youxi provinciae Fujian 18 Octobris 1130–23 Aprilis 1200), fuit calligraphus, Confucianismi eruditus domus Song, dux Scholae Principiorum, et potentissimus Neoconfucianismi adsectator Sinensis, qui hominum ratione omnia comprehendi censuit. Se ad studium philosophiae Sinensis contulit, cui dedit propriam significationem operum Analectorum Confucii, Mencii Libri, Magnae Eruditionis, et Doctrinae Mediae (Quattuor Librorum appellatorum), vehementius dixit indagationem rerum (gewu), et synthesin omnium notionum principalium Confucianarum fecit. Zhu Xi, ex familia in Wu-yuan Comite Praefecturae Hui (徽州婺源县, in hodierna Jiangxi Provincia sitae) orsus, in vico Yuxi provinciae Fujian natus est, ubi pater erat praetor subpraefecturae. Bruce, J. Percy. 1922. Chu Hsi and His Masters. Londinii: Probsthain & Co.
Carpenter, Bruce E. 1977. "Chu Hsi and the Art of Reading." In Tezukayama University Review (Tezukayama daigaku ronshū) 15:13–18. ISSN 0385-7743. Chan, Wing-Tsit, ed. 1962. A Source Book in Chinese Philosophy. Princeton, N.J.: Princeton University Press. Chan, Wing-Tsit. 1967. Reflections on Things at Hand. Novi Eboraci. Chan, Wing-Tsit, ed. 1986. Chu Hsi and Neo-Confucianism. Chan, Wing-Tsit. 1987. Chu Hsi: Life and Thought. Chan, Wing-Tsit. 1989. Chu Hsi: New Studies. de Bary, William Theodore. 1981. Neo-Confucian Orthodoxy and the Learning of the Mind-and-Heart. Gardner, Daniel K. 1990. Learning To Be a Sage. Berkeley: University of California Press. Munro, Donald J. 1988. Images of Human Nature: A Sung Portrait. Tillman, Hoyt Cleveland. 1982. 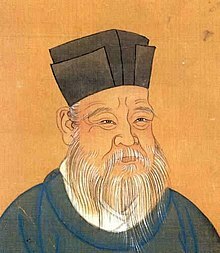 Utilitarian Confucianism: Ch‘en Liang's Challenge to Chu Hsi. Zhu Xi. 1990. Learning To Be a Sage: Selections From the Conversations of Master Chu, Arranged Topically. Convertit Daniel J. Gardner. Berkeley, University of California Press. Vicimedia Communia plura habent quae ad Zhu Xi spectant.